On October 2nd, The Mount Road Mahavishnu, which also goes by the name of The Hindu, wrote about the deployment of VVPAT based EVMs (Electronic Voting Machine) in all the constituencies in the Gujarat election. In an Editorial written on October 2nd, 2017, it declared that the use of Voter Verifiable Paper Audit Trail (VVPAT) system was a regressive step. Was the post disappointed that the latest, third generation, tamper-proof machines were not going to be used in all the constituencies? Well, we don’t know that. The EC Press Release just says that VVPAT enabled EVM machines will be deployed in all the 50,128 polling booths. It does not say if all these machines are Third Generation. Why is this important? Because only from the third generation product it is impossible to modify the firmware, the software that runs the EVM. This makes it impossible to tamper the EVM firmware in the field. Recent elections have all been registering a higher than normal percentage vote (say around 70% +/- 5%). Historically, the percentage has been closer to 50%. Could it be possible that the EVM is tampered in a way that causes a single press of the button to cast multiple votes? For instance, 1 press of the button for Candidate A adds 2 to his tally?! A variation on the above theme – Every 4th vote (or 5th, it does not matter) cast to Candidate A gets counted in Candidate B’s column. This is a subtle variation because, in this scenario, the voter percentage will not bloat. At the time of counting, the above ruse is carried out using say a Cell phone. This is highly unlikely because, the EVMs would have had all their ports such as Bluetooth, Wi-Fi, Serial port, USB etc. turned off or disabled. At least that is how it should be. The ECI website has a good Q and A on this. All the above scenarios could happen with the VVPAT enabled EVM too. I have a simple solution that will catch all the above bugs. Each booth usually records around 1500 votes. 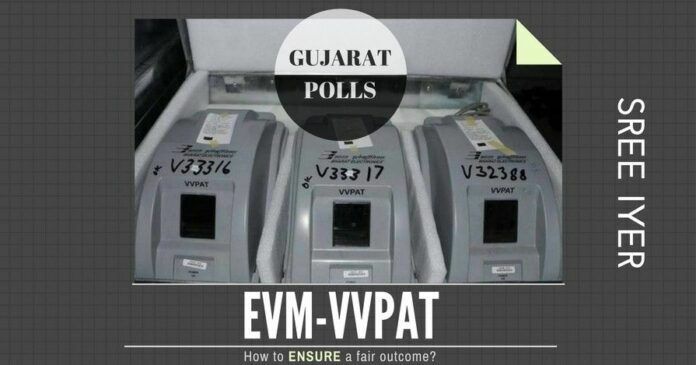 Let us say that the number of EVMs used in the Gujarat elections is 100,000. It is just a convenient number. It can be less or more. Before counting starts, randomly select about 10% of the EVMs. That would be 10,000. Manually count about a 100 of these, again chosen randomly, by reading the Printed receipts. Since there are up to 1500 votes per booth, this process should not take too long. Say a couple of hours at the most. In these 100 EVM machines, the electronic count should exactly match the manual count. If there is a mismatch, set aside that EVM. Continue till all the 100 EVM machines are verified. If all the 100 tallied, then pick another 100 from the remaining 9,900 EVMs. Repeat the process. For all the EVM machines that did not tally, all the associated machines in that constituency must be hand counted and the result be announced based on that. The rest can be counted electronically. So by just randomly testing 2% of the EVMs and validating their count, it would be possible to enhance the veracity of the voting process. The picking of the random EVMs should be done in full view of agents from all parties and should be open to media so that the randomness is guaranteed. The manual count should also be done in full view of the public. The added overhead of this process is perhaps another 4 hours but it is worth it. After all, the voters of Himachal Pradesh are going to have to wait for more than a month to know who their next Chief Minister is going to be! The ECI does not have to agree to my proposal – all they have to say is that it is under consideration… Any EVM tampering requires insider help and this will deter mischief makers from tampering with the machines. Next articleReel life meets Real life in Kerala – One BJP worker dead… Or was it a CPI-M comrade? well,how innocent you are,,if EVMs are manipulated,it will happen with the connivance of select EC members especially at operational level.Only way it can be exposed is by careful analysis of voter count with the voter list of that particular polling station.I am sure there is a scam in this considering money involved in winning an election.Unfortunately there are no whizkids involved in scrutinising the election process. Disagree. You have speed-read the article. I wish EVM machines to continue to be available for “tampering” for BJP has to win & Khangress to lose. BJP has to be given next 15 years to streamline the entire mess Khangress has done to the country. So long BJP is doing good to the nation, everything is fair.